Fortune 500 consumer goods client reported suspicion of company employees redirecting inventory potentially worth several hundred thousand dollars per year for resale and personal gain. 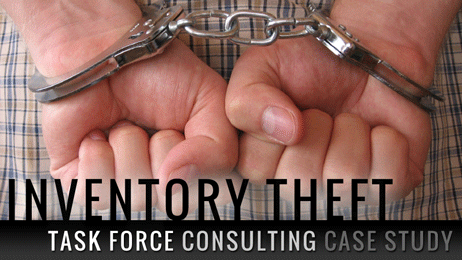 Client initially requested that undercover operatives be placed in their facilities to detect theft of product and time. Corporate officers were advised that this proposed solution would not be an effective use of resources due to low probability of gaining meaningful intelligence or hard evidence. Task Force instead recommended that a team of three former federal agents be deployed to interview and interrogate employees to gather evidence that could be used both in the civil and criminal arena. After three days of interviews with eleven employees, Task Force uncovered an elaborate, ongoing scheme to steal product and sell on the open market. 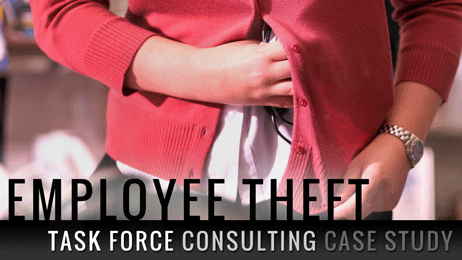 Within ten days, forty-six employees in three different States were identified as being involved. All employees involved were terminated. Coordinating with local law enforcement, seventeen individuals were arrested and received felony convictions, with thirteen receiving prison sentences. Major health services client entered into purchase agreement for approximately $8 million of computer equipment and paid for the order in full upfront. After several weeks pass, client realized that the vendor in question had ceased business operations with no intention of returning client funds or fulfilling the order. Task Force deployed two consultants to multiple cities to investigate vendor operations, interview client and vendor employees, and track funds domestically and internationally. After three days of interviews, it was determined that 98% of the funds were located in an offshore account. 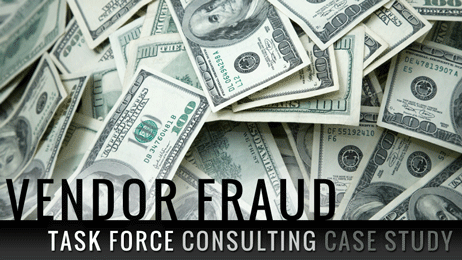 Task Force personnel coordinated investigative efforts with U.S. Federal Agents, client counsel, and foreign law enforcement and bank officials to effectively freeze the funds and document the situation for potential prosecution. Twelve days later a wire transfer returned 98% of the funds to client account. A Human Resource Director called on Task Force at the direction of the Chairman of the Board and informed us that the President was known to be having an affair with a subordinate. Notwithstanding the fact that the executive was married, company policy expressly prohibited such office relationships. The clients also determined that there was a significant risk of legal action by the female against the company and the executive if and when the relationship eventually became public. Although the affair was routinely known and discussed within the company, the Chairman had no hard evidence to support termination of the employees for violating company policy. Task Force was engaged to operate a ten-day surveillance, which soon caught both subjects in compromising positions and places on videotape. Task Force management presented its findings to the corporate board and discussed strategic options to resolve the situation, with the goal of minimizing the risk of a lawsuit from either party. The board agreed that Task Force should manage the termination process for both employees in a discreet and confidential manner using the video evidence as justification. This enabled the client’s Human Resources department to maintain a level of separation from the process to minimize legal risk while effectively bringing the situation to a close. A major software company was concerned about recent setbacks in product development and personnel recruitment that seemed more than mere coincidence. CEO noticed that competitors were introducing leading-edge software products only days before client planned to launch its own products with similar features. In addition, several career applicants had recently turned down significant job offers only to join competing firms days later. 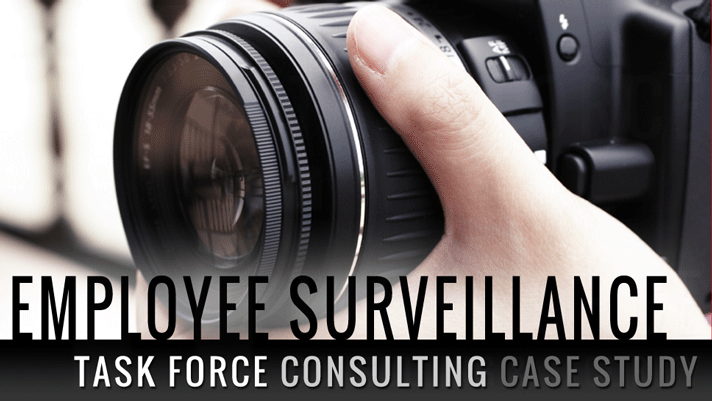 After conducting a security risk analysis of their own, board members engaged Task Force to conduct an electronic eavesdropping detection sweep of their corporate facilities. During an exhaustive sweep of the facility it was discovered that the client’s phone lines were being monitored, specifically in the product development department. Two small video cameras and one listening device were found recording the activities of employees. 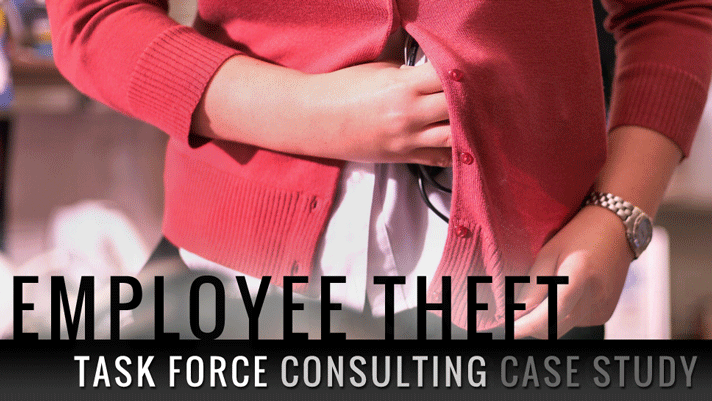 Lastly, Task Force specialists detected a listening device in the Human Resources Director’s office coffeemaker. Because the devices were from the black market, there was no feasible means of directly discovering those responsible for planting them. After consultation with Task Force, management chose to remove the devices immediately rather than leave them in operation and provide misleading information to the culprits. Soon thereafter, client’s success with new product launches and hiring of key personnel improved dramatically. 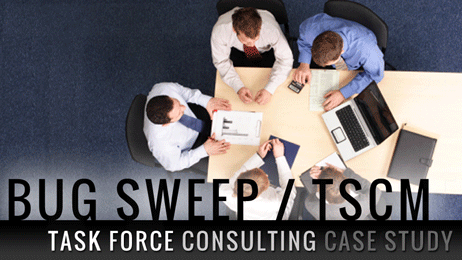 Client continues to engage Task Force for regular electronic eavesdropping sweeps. Recreational equipment manufacturer retained Task Force to help increase profits and identify lost revenue due to suspected misappropriation of inventory by employees. Two consultants were deployed to interview key employees and follow up with interrogation of employees suspected of inventory theft. Within eight hours of commencing interviews, two employees admitted their involvement in a conspiracy to redirect product to sell at various venues across the U.S. Task Force quickly uncovered the entire network of employees involved in this scheme, with eleven additional employees admitting guilt in an effort to avoid possible criminal prosecution. In consultation with client executives, it was determined that the best course of action was to let time pass before proceeding in order to avoid a significant disruption to ongoing business operations from employee defection before replacements could be hired. The client was also wary of negative publicity surrounding the situation, so Task Force proceeded under confidentiality and supported client’s request to avoid prosecution. During that time, a dozen employees resigned or never returned to work. The suspected employees were replaced, and profits for the following quarter doubled. A major U.S. financial institution retained Task Force to investigate a recent disproportion of advertising expenditures versus the number of clients inquiring about and subsequently obtaining loans. Client reported that it had recently increased spending on national and local advertising to over $2 million per month, yet metrics for closed business had shown no noticeable improvement. 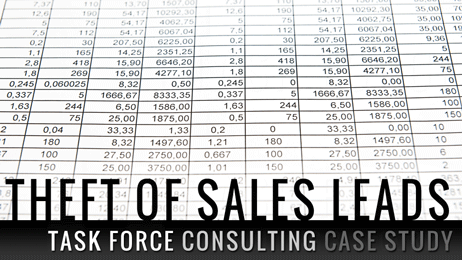 Task Force consultants were deployed to interview several employees in the loan sales and IT departments. Our consultants quickly determined that several of the client’s loan officers were selling leads to other financial institutions for personal gain. In addition, interviews confirmed that the client’s IT staff was grossly mismanaged and under-staffed allowing competitors to easily access proprietary computer data containing specific leads. Task Force consultants also interviewed numerous potential loan applicants who had originally called our client but were subsequently routed to a new company in a follow-up phone call by client staff. In a matter of days, Task Force delivered a comprehensive report of findings and specific recommendations to client. Implementation of these recommendations resulted in a dramatic increase in the number of calls received, loan applications processed and loan approvals. Client’s return on advertising spend for the first quarter after the completion of this project was in excess of 400%. A major trucking company retained Task Force because recent fuel and hourly wage expenditures were not consistent with historical experience for several trucking routes across the U.S. Conventional vehicle tracking devices and monitoring systems used by the client were ineffective in providing answers. Task Force personnel developed a surveillance plan for specific trucks with known schedules. Surveillance initially confirmed that all tracking systems were working properly and being monitored professionally. After several days of surveillance, Task Force uncovered an elaborate plan by several employees to use company resources for personal gain. Workers from a competing logistics firm were meeting client drivers along the designated route and loading additional freight on their trucks, effectively “piggy-backing” loads on an existing truck route. After the client’s trucks traveled across the country, workers from the same firm would meet the driver again to unload the freight before the truck reached its final delivery point, paying the drivers in cash for their “services.” Meanwhile, remote monitoring from the corporate facility indicated that the drivers were on the correct route without deviating significantly from their schedules. Task Force reported its findings along with photo and video proof to client executives. Employees involved in the scheme were immediately terminated and prosecution is pending using the gathered evidence as support. A major international law firm retained Task Force to assist with a case alleging that a client’s Chief Financial Officer was engaged in manipulating the company’s financial statements and directing personnel in his department to do the same. If true, the company and its key personnel could be guilty of securities fraud and regulatory violations and would face legal challenges on several fronts. Task Force completed a thorough interview and interrogation process with dozens of current and former employees. Our consultants produced legal documentation, including statements signed under the penalty of perjury, verifying that employees were indeed guilty of inflating figures, falsifying regulatory forms and creating non-existent off-shore companies and bank accounts. 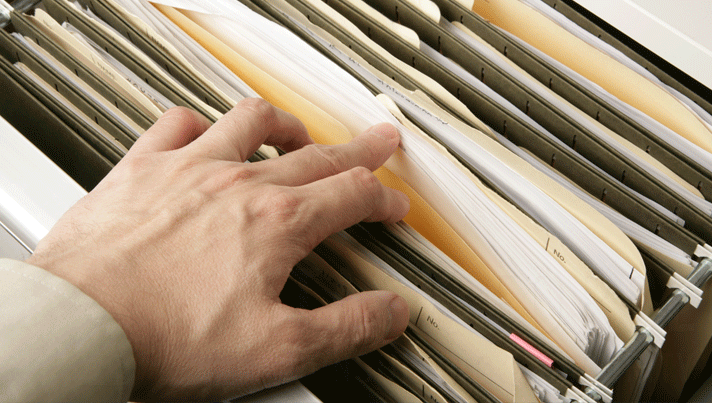 A detailed report was provided to the client law firm which served as the foundation for a case report forwarded to the U.S. Attorney's Office in an effort to comply with federal investigations. The documentation produced by Task Force under the client’s guidance resulted in several guilty pleas and favorable trial results. 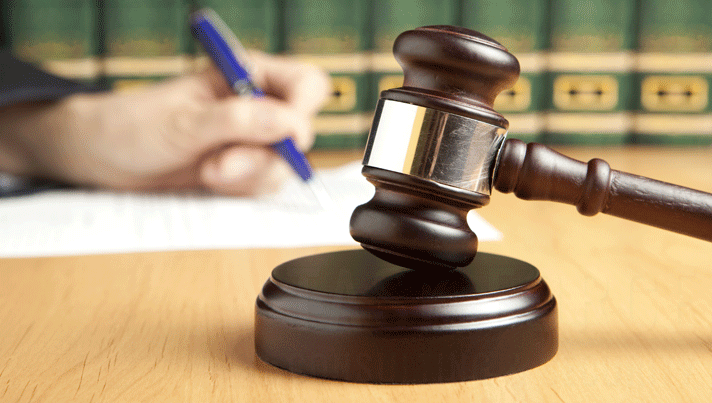 By confronting their internal issues head on and aiding federal authorities with the investigation, the client company was able to effectively mitigate legal action on a corporate level and confine the scope of legal proceedings to several employees acting alone to protect their own careers. 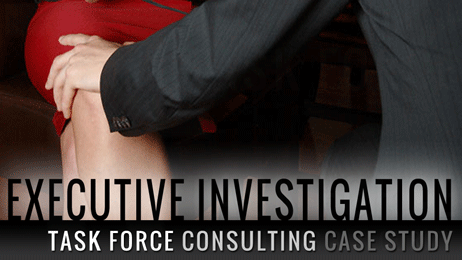 Task Force Consulting is a highly-experienced investigation agency with an unsurpassed ability to identify the problem, obtain necessary evidence, and provide a solution that prevents future recurrence. We make significant continual investment in current, top-of-the-line detection equipment. Our personnel are highly-trained, experienced former Federal agents who discover bugs of all kinds: wiretaps, video cameras, eavesdropping devices, and transmitters. 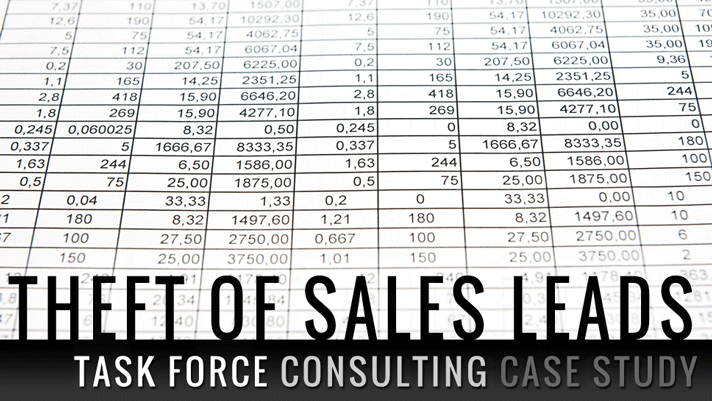 Task Force Consulting conducts thorough backgrounds throughout the United States using a proprietary in-house computer system. 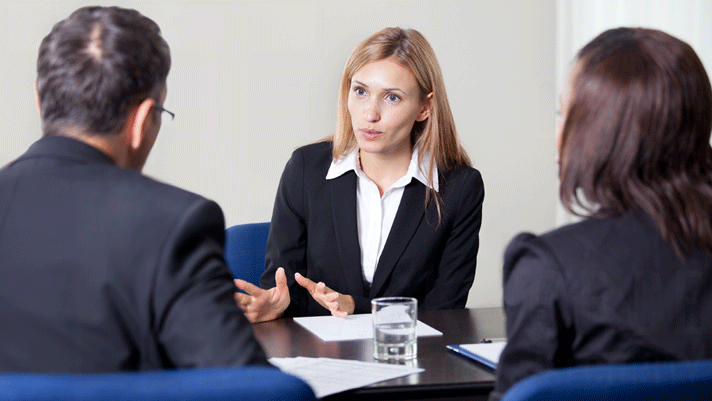 When necessary, we conduct interviews of potential employees applying for the most sensitive positions of the corporation. The vast majority of these problems can be handled directly with the employee during an interview and interrogation process with two trained investigators. 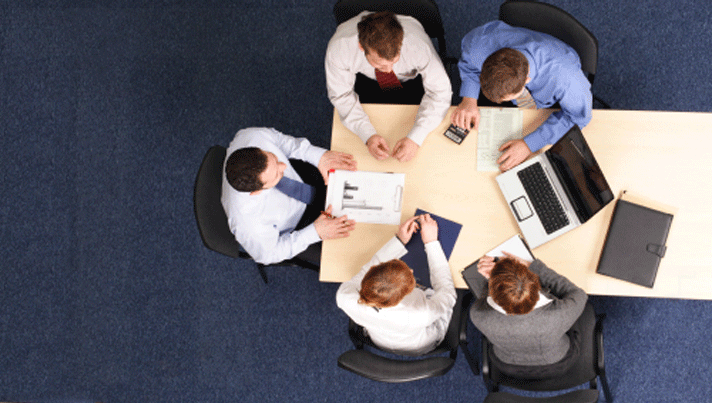 Task Force Consulting is an investigative agency recognized by the Workers' Compensation Board. 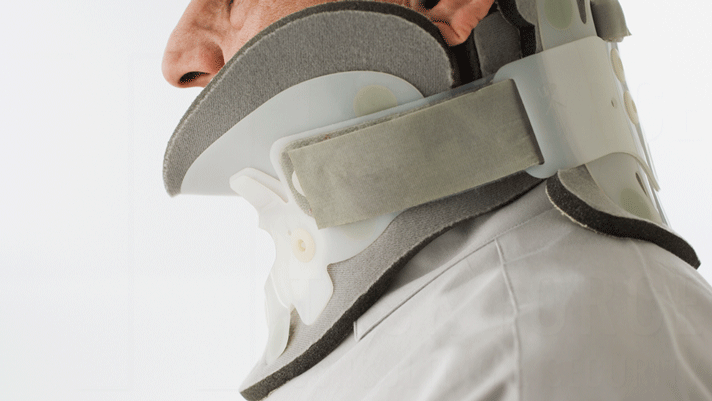 We conduct surveillance on the subject to determine the scope of his injury. We give you a full report, photos & videos. We assist with the referral to the Department of Insurance for fraud. 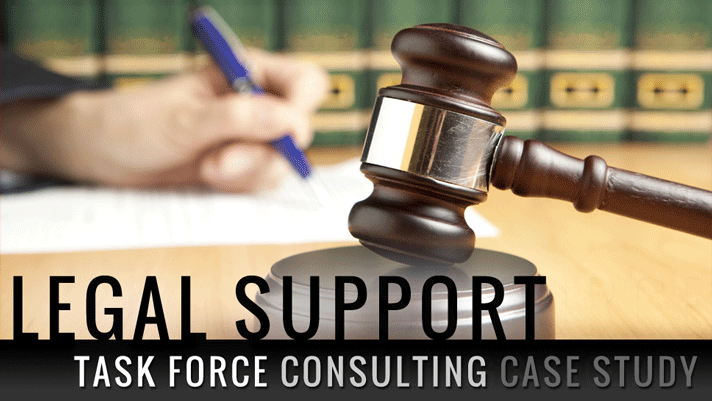 Task Force Consulting's investigators are all certified by multiple testimonies as experts in Federal, State or local court. It is rare that we are ever challenged by opposing counsel. Task Force Consulting is headed by Thomas G. Martin, a former supervisory Federal agent, and the owner of Martin Investigative Services. He oversees 22 male and female private investigators, all of whom are former supervisory Federal agents. You can also find Martin on Google+, Facebook and YouTube.